Chris on Major Winter Storm To Impact Southeast Then East Coast. 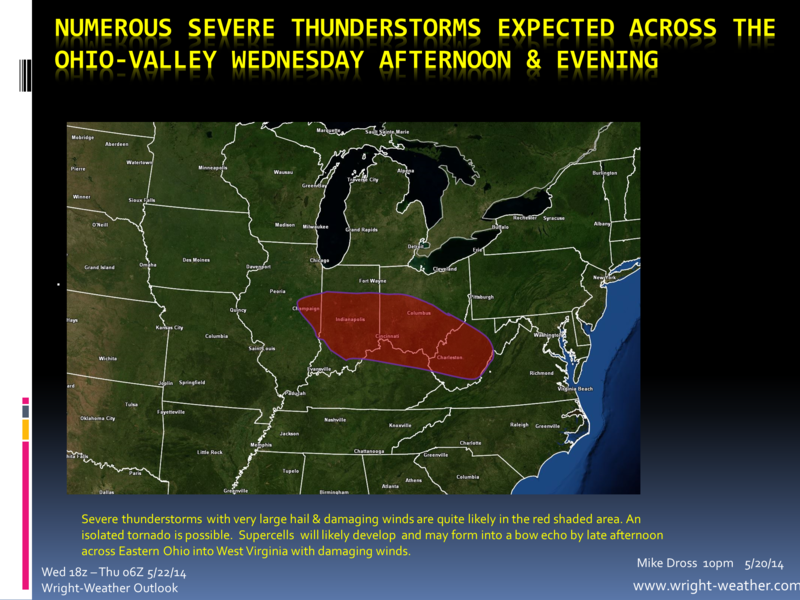 A slow moving cold front across the lower Great Lakes will provide the low level convergence, combined with favorable instability & shear to ignite numerous severe thunderstorms Wednesday afternoon across the Ohio-Valley. Supercells will be a likely storm mode as bulk shear values will be in excess of 45 knots. In addition, 0-3km helicity values will be over 200, so there is a chance for an isolated tornado in the strongest supercells, although conditions are not ideal for tornado development. Large hail and damaging winds are the primary hazards. Supercells may evolve into a linear or bow echo configuration by late afternoon or evening. Storms will likely diminish and weaken as they move east-southeastward into Central Kentucky Wednesday night where the low-level theta-e values will be significantly less, resulting in much less instability.